TENDONIL is a gel composed of vegetal oils highly charged in oxygen. It optimizes the preparation and the recuperation from exertion. It soothes the temporary stiffness and pain of tendons, joints and muscles. Extrodinary deep penetrating, massage gel for tendons, joints and muscles. High tech soothing relief can be used before and after an event. A major breakthrough in the horse industry. Physical exertion often develops undesirable reactions. Tendonil is a gel with high penetration strenght which helps in prevention. Tendonil is a great way to relieve sore muscles and tendons before and after an event. By simply massaging this product into your horse’s legs you will ensure your horse comes out of the stall feeling great and ready to go to work. 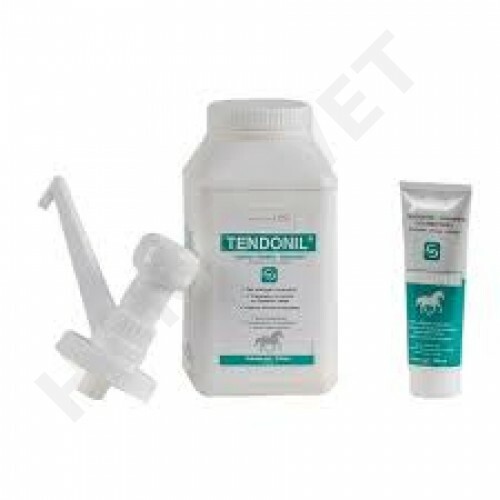 Use Tendonil to help horses tendons, joints and muscles stay fit and relaxed. Apply TENDONIL before and after physical exertion on legs, joints or muscles with gentle massages against the hair until complete penetration. TENDONIL can be used with wraps. For tendons a cotton swab impregnated with gel may be placed under the bandages to increase the contact time. Does not contain any doping ingredients. TENDONIL 250ml. by Laboratoire L.P.C./France.